Around lived up to name the minute I walked into the Dancemakers Centre for Creation. Rather than finding a stage and a row of seats, I found a white curtained-off circle in the middle of the space. This set up the dancing to feel a like an installation or a moving sculpture; something that has no one right way of being seen. Around is an experiment, in movement and sound, and there are no right or wrongs. 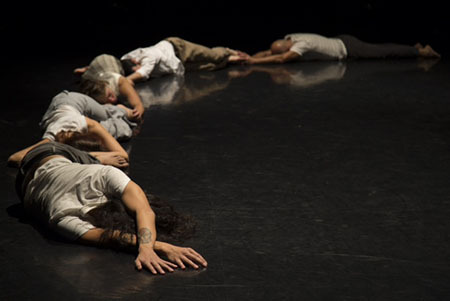 This experimentation and willingness to dive into unexplored territory is one of the things I love about Dancemakers: it is theory and question in practice. If you have ever wondered what it would look like or sound like for the body to do some crazy esoteric thing, Michael Trent and Dancemakers has probably tried it. I am a huge junkie for experimental theatre: anything that I have no idea how to feel about completely and totally thrills me. I love the unknown, and that is exactly what Dancemakers embraced with Around. Around is a series of encounters between the dancers’ bodies and the rest of the world, or as Trent puts it, the unknown. Over about 60 minutes there are a number of these encounters, each one different from the next. They range from subtle duets to group dances, and include humorous and quiet nostalgic pieces. My favourite element of the work was Christopher Willes’ playful sound score. It was experimental in the true sense of the word: it was testing the nature and possibilities of what sound can be. At times I felt that it overshadowed the dancers, and also distracted from the intent of the work. By physically manipulating a microphone the dancers created a range of fascinating sounds, but at times I thought the dancers became too preoccupied with making cool noises than with actually encountering the unknown with their bodies. Beyond the stage that had been set up in the middle of the space, the dancers manipulated the curtains to reveal more performance space. The small breakout performances behind the audience were not seen by everyone. Obscured by curtains, people, or sight lines, these dances added to the idea that each person in the audience has individual experience of the work. If you are an experimental theatre junkie like me, always looking for the next theoretical question to be put into physicality, then I recommend Around. It is full of questions and possibilities, and 10 lovely dancers.